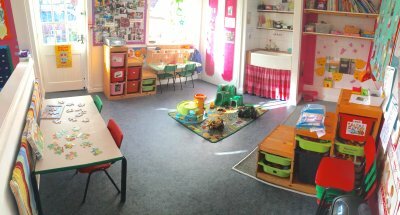 The Toddler room offers a friendly relaxed family atmosphere for children, from 2 years to 3 years to develop. The toddlers can explore and learn through a wide variety of planned activities. Stimulation at a young age encourages happy, inquisitive toddlers to become confident children ready to grasp the concepts of learning skills for later on in life. The toddlers are encouraged to join in simple activities, which improve their mental and social awareness. 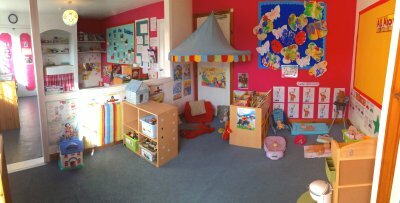 The toddlers have regular access to sand, water, playdough and sensory play. Music time is very special to the children and important for the development of language and coordination when the children join in the ‘action’ songs. It is especially rewarding when one notices the most introverted child responding. Toddlers are regularly taken out for walks in the town and also once a month they are taken out on a forest school session. We believe in the development of the whole child. We recognise that each child is different and that they should be allowed to develop at their own pace.